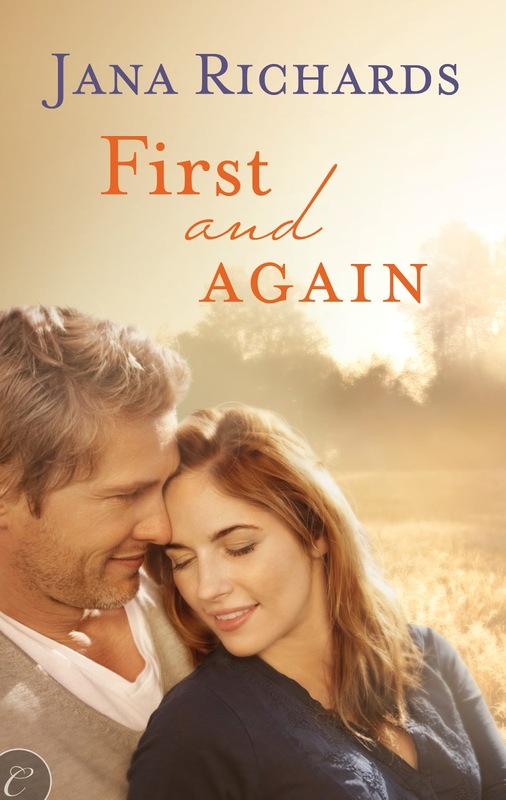 Sneak Peek Sunday with FIRST AND AGAIN! He regretted his words the instant they spilled from his mouth. She stared at him a moment, hurt flickering in her eyes. Then she looked away, blinking rapidly. “Don’t worry, Jack. I won’t presume anything.” She headed for the closet at the back door. Bridget set down the receiver of the phone and smiled at her sister. “I already am,” she replied. It was true. Between the growing catering business and the restaurant that she and Tina had just reopened, she was working harder than ever before. But somehow it didn’t seem like work. It felt like she was having a good time with her best friend doing what she loved. If someone had told her a year ago that Tina Wilson would become her best friend, she would have asked what he was smoking. Mavis came in through the back door to the restaurant carrying two large vases filled with flowers. “Okay Grandma.” She walked toward the banquet tables with her arrangement of gladiolas and lilies. She made her way outside. The coolness of the air conditioned restaurant was a sharp contrast to the hot July afternoon. Jack and Gavin had borrowed a couple of gas barbecues in order to cook up enough hot dogs and hamburgers for the hungry crowd that was on its way. It was true. She was surrounded by the people she loved in the town she’d come to love. She felt like the luckiest woman in the world. She knew without a doubt she belonged in Paradise. Thanks everyone! I hope you enjoyed this deleted scene! Winner on my Spring Fever Post! 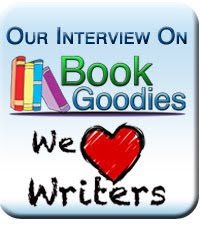 Thank you to everyone who entered and thank you to the wonderful staff at Marketing for Romance Writers for setting up the blog hop. Cheers! 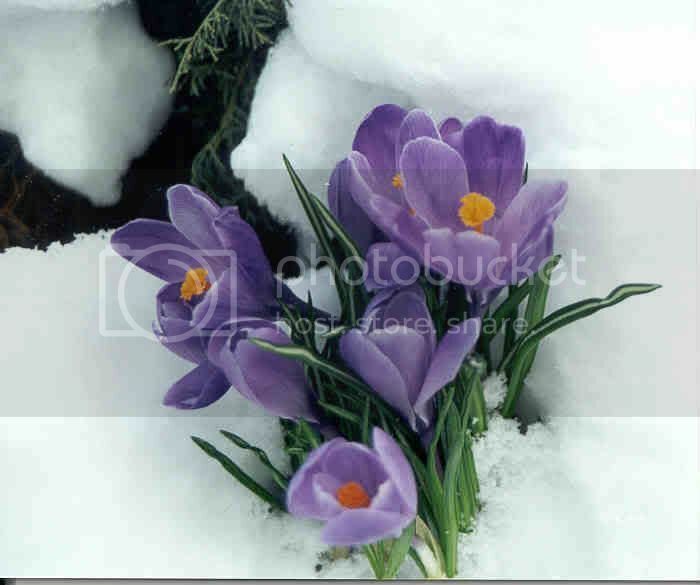 When I was kid growing up on a farm on the Canadian prairies, I knew it was spring when the crocuses bloomed in the pasture. Sometimes, they were so anxious to bloom that they pushed their way through the snow, somehow managing to survive. I feel a little like that this spring, so anxious for some warm weather that I'm ready to blast through the snow. It's been a very long, long, long winter and I'm ready for it end. My back yard. My husband used the snow blower to make a path so he could get to the shed, and so the dog could do her business without drowning! My front yard, looking across the street toward my neighbor's house. Yes, my garbage cans are out there too. You just can't see them because they're in front of the gigantic snow bank on the street! So for a while, I'm going to have to dream about flowers, playing golf, walks with my dog, and other good things I like to see and do in the spring. How about you? Is it spring where where you are? Or are you still waiting like me? 1. Comment on this blog and tell me something you like about spring, or something you plan to do this spring. 2. Like my Facebook page. Send me an email at jana.richards@hotmail.com with SPRING FEVER in the subject line to let me know. 3. Follow me on Twitter. Again, email me to let me know. 4. Subscribe to my newsletter. I send out a few newsletters a year to let readers know about new releases, contests, and other news. 5. Follow me on Goodreads. Email me at jana.richards@hotmail.com to let me know. You don't have to do all five things, but the more entries you make, the more chances you have to win. I'll pick one name at random by April 15, 2014. The chances of winning depend on the number of entries. Good luck everyone! To whet your appetite, here's the blurb and a short snippet from ALWAYS A BRIDESMAID. I hope you enjoy it! Wanting nothing more than to comfort, she wrapped her arms around his waist in a hug. He held her tightly, pulling her against him and burying his face in her neck. Dani inhaled the intoxicating scent of spicy aftershave laced with underlying notes of warm, clean male. How could Chantal treat a wonderful man like Zach this way? She gently pulled away, keeping him at arm's length. "You're going to get past this, Zach." "It doesn't feel like it right now." "I know, but someday, when you're old and grey, you'll be sitting on the front porch with your wonderful wife of fifty years, and you'll say 'Thank Heaven Chantal cheated on me or I never would have met you.'" He made a sound somewhere between a laugh and a sob. "Fifty years, eh?" Some lucky girl would snap Zach up in a minute, and if she was smart, she'd shower him with the love and consideration he deserved. Some lucky girl, but not me. Reluctantly, she took a step back. He squeezed her fingers before letting her go. With her heart pounding in her chest, and regret nipping at her heels, she hurried from the church. Before she did something stupid, like kiss the jilted groom. Don't forget to enter my contest! Scroll up to see how. 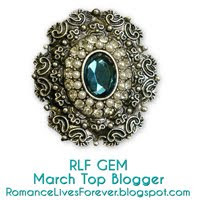 And once you have, I hope you continue hopping your way through the MFRW Spring Fever Blog Hop.Here's the link if you need it: http://is.gd/mfrwave Happy Spring everyone! Zane Martin's teenage daughter is pregnant. Meg Evan's son is the baby's father. Because Zane grew up not knowing who his father was, he'll be damned if he'll let his grandchild live with that shame. Meg was forced into an abusive marriage because of an unplanned pregnancy, so she knows that love is the only good reason to marry. 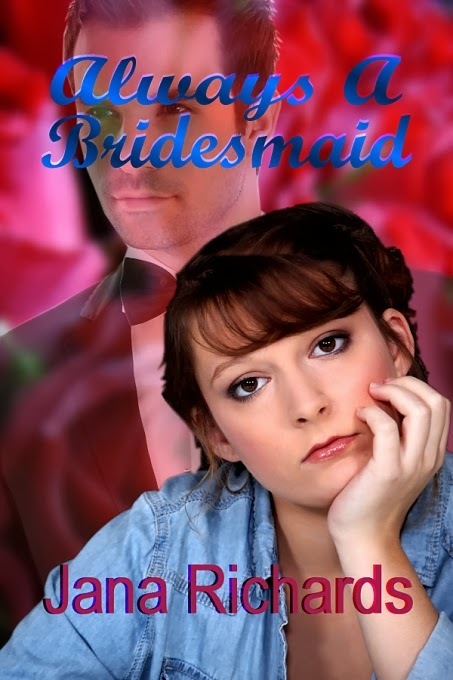 Neither Meg nor Zane expects or welcomes the attraction that sparks between them. As they await the impending birth of their grandchild, old wounds open and long hidden family secrets come to light. The young couple builds a newer, stronger relationship, while Meg and Zane reach for a love passionate enough to overcome the past--if they're strong enough to trust it...and each other. She stopped a few feet from his booth. Had Jane mentioned his name? From this close, he appeared tougher than the regular run-of-the-mill businessman. A jagged scar ran across the back of his hand, while another began at his left temple and disappeared into his eyebrow. She cleared her throat when he looked up, extending her hand to him. "I'm Meg Evans. You wanted to speak with me?" He stood and took her hand in a brief shake, his mouth unsmiling and tense. "I'm Zane Martin." He looked around. "Is there somewhere we can speak in private?" Warning bells clamored in her head. "Anything you have to say to me, you can say right here." There was no way she was going anywhere private with this guy. She slid into the seat across from his. He sat again and laid his hands on the table, his palms flat against the smooth brown Formica. Frowning, he said, "Are you sure? What I have to say is very personal." "Look, Mr. Martin, I don't know you. I have no idea what you could possibly want to say to me, but whatever it is, I'll hear it right here." She folded her arms across her chest. He studied her for a minute, his look enigmatic. She returned his scrutiny, wondering how he'd received the scars. Despite their dangerous appearance, they didn't take away from the attractiveness of the man. He fidgeted for a few seconds, and then suddenly blurted out, "Your son got my daughter pregnant." A LONG WAY FROM EDEN is available from Uncial Press and other major e-book sellers. After causing three cooking fires in her apartment, Iris Jensen finds herself homeless. 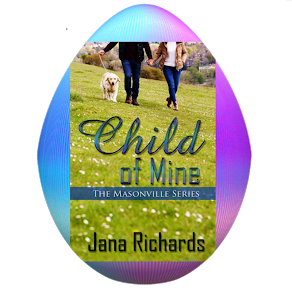 She lands on Riley Benson's doorstep, looking to rent a room in the beautiful old home he's restoring. It's only for six weeks until Iris leaves Portland, Oregon for her new job on a cruise ship. Firefighter Riley knows exactly what a bad tenant she can be. But he needs money to finish the work on the house he loves. And something about Iris pulls at his heart…Meanwhile, in Heaven, two angels watch over the young lovers. Angelica and Hildegard work in Heaven's Relationship Division, where angels match mortals with their soul mates. The angels believe so strongly in Iris and Riley’s love that they break Heaven's rules to help them. Can the the angels convince them their love will last a lifetime before time runs out? Riley’s heart tripped over itself when he answered an insistent knock at his door. Surprise didn’t come close to expressing what he felt when he discovered Iris Jennings on his front porch. The woman who’d occupied his thoughts for the past week wore a deer-in-the-headlights expression, obviously as shocked to see him as he was to see her. “Riley Benson.” It was humbling to know she didn’t remember his name. What on earth was Iris Jennings doing at his house? And if she didn’t know his name, how had she found him? 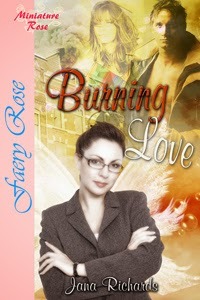 BURNING LOVE can be purchased from The Wild Rose Press and at other major e-bookstores.